If you favor the origin of man's best friend, display your bowie as a nice addition to your home or office. The bowie knife is 8 3/4" overall with a 5 1/3" stainless steel blade that is adorned with illustrative etchings of wildlife scenery. The display is made of a brown resin and is modeled after stag antlers. Great buy as far as display knives go. It does have a horrible job as far as the handle due to it being glued on. Mi e once I received it was wiggling then popped off after a couple of thrusts into a card board box. But beautiful nonetheless. 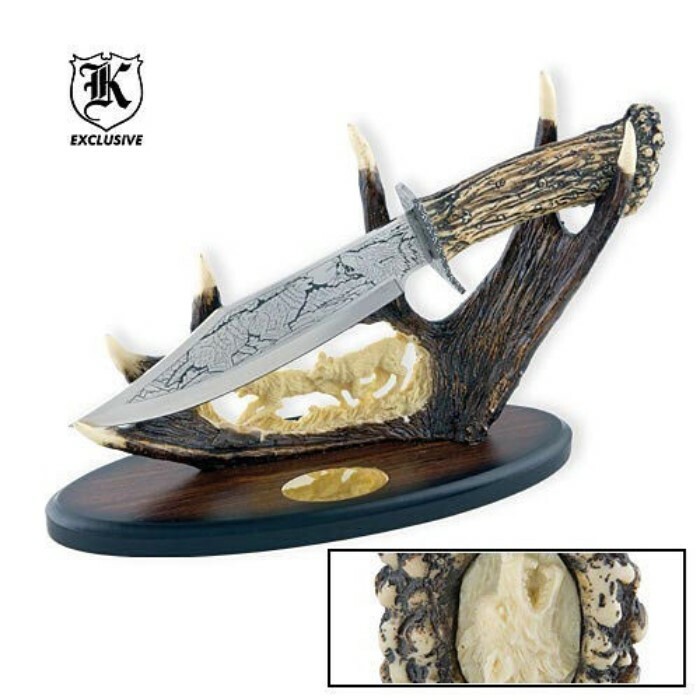 The art and design of the blade is awesome i love wolves so this was a must buy for me You wont be dissapointed.